It's been six years since my father died and I am still wishing that he is still alive. I missed him very much especially when we had our vacation in the Philippines. We brought the kids to his graveyard when we were there. I'm sure that he's happy to see his grand children. Today is Papa's birthday and I couldn't help but to long for him. I know that I did not tell you as often as I could when you were still here on earth but God knows how much I love you! May God grant you the peace in His kingdom. I miss you! 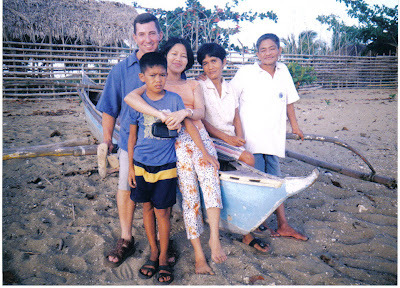 This picture was taken when John first meet my parents and family! Papa tried very hard to talk to John, I can still remember all the words that he told my husband.